Today marks the release of the book for which you’ve all been waiting patiently or impatiently (I’ve got the emails to prove it! ), and with it a very special limited-time offer (see details below). But first, let me tell you how we got to this point. About three years ago, Denise Minger – a statistics-savvy English major in her early 20s – set the nutrition world ablaze with her careful, methodical parsing of the data behind The China Study. As your probably know, The China Study is that “authoritative” tome that vegans and vegetarians carry around as an instant comeback to any omnivore who dares assert the healthfulness of consuming things with faces. I was very impressed with her ability to take otherwise overwhelming data sets and pull out conclusions that were equally – if not more – valid than what the research scientists were culling from their own studies. Her China Study takedown was the capper. We met for lunch and I pitched her this idea of a book that would inform and educate the general public as to how we have been misled by the “authorities” (public policy makers and researchers) and which would deconstruct the precise history and point out the failed logic, so that anyone could see what a disaster the pyramid was. 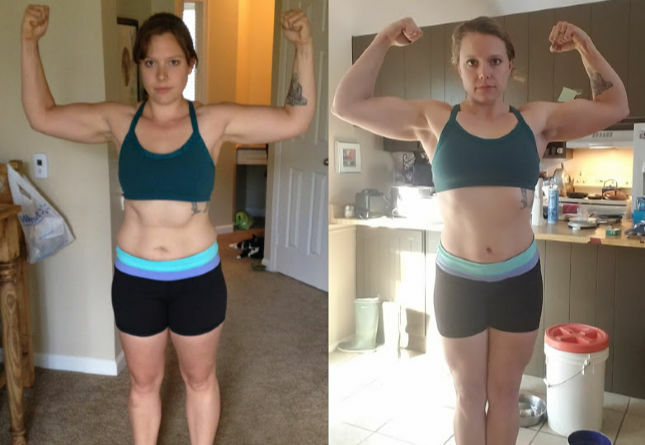 I wanted it to appeal to everyone – not just Primal/Paleo – as an empowering tool. Death by Food Pyramid is the long-awaited result, and it more than succeeds in achieving its goals. On these very pages, you’ve seen her dissect the flawed science pointing the finger at red meat’s homicidal tendencies and a low-carb diet’s predisposition to give you heart attacks. You’ve marveled at her witty deconstruction of the purportedly inevitable conclusions to a high-fat diet – type 2 diabetes and breast cancer – as well as the claimed life-extending effects of whole grains. And when you worried whether fish oil would give you prostate cancer, Denise was there to quell your concern. Now, with this book, she sets her sight on the disastrous, farcical USDA Food Pyramid, exposing the twisted liaisons between government and industry that enabled it and dismantling the shoddy science and erroneous conclusions supporting it. 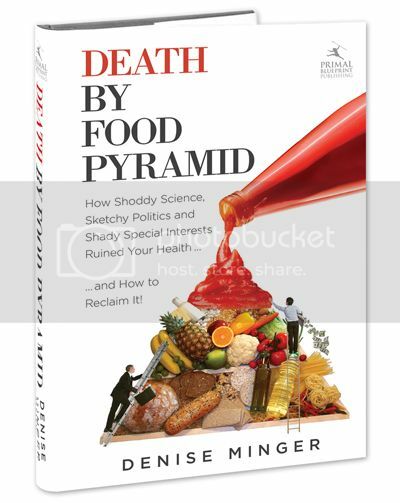 Ultimately, Death by Food Pyramid is about empowering you, the consumer, the eater of food, the arbiter of what goes in your mouth, to make the right choices and bypass the middlemen when it comes to interpreting science. That’s what Denise has been doing throughout her short but eventful career, and now she’s giving you guys – the readers – the keys to the kingdom. Of course, empowerment doesn’t come easy. It’s not instantaneous. Troubling emotions will arise as you read. You’ll feel shock – at what passes for evidence-based nutritional guidelines. You’ll get angry – at the entrenched special interests shaping government policy and deciding what humans should be eating. You’ll be sad – when you realize how far back the experts have set us. You’ll be confused – as to how we could have gotten things so terribly wrong even with all the evidence standing right in front of us, waving its arms frantically, and jumping up and down. But you’ll also be informed. This stuff stinks, and it shouldn’t be like this, but ignoring it won’t make it go away or render it impotent. You have to face it. Luckily, you’ll come away with the ability to spot the inconsistencies, the bad science, the misleading interpretations that fool so many people (citizens, politicians, doctors, and researchers alike). Who’s this book for? Anyone currently relying on exogenous sources of nutrients for sustenance – whether you’re in the United States, subject to the Food Pyramid and its related offshoots, or living abroad and bearing the brunt of similar policies. Tragically, the US-borne “fat bad, meat bad-ish, animal fat lethal, sugar mostly-harmless, grains good” message has disseminated globally. No one is totally free from it, and it’s important to know how it started, and what we can do to reverse its damage and take control of our health. If everything you’ll learn above isn’t reason enough to grab a copy right now, I’m offering you some fantastic free gifts through Tuesday, Dec. 31, 11:59 pm PST. $10 Gift Certificate to PrimalBlueprint.com. Spend it like cash and order whatever you want, perhaps a copy of The Primal Blueprint to go with Death by Food Pyramid? 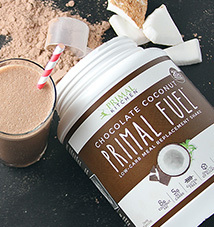 Or use it to try a Primal Essentials Kit, Primal Fuel or Master Formula on for size! 10% Off Coupon for a Focal Mogo from FocalUprightFurniture.com. A mobile, telescoping stool that’s perfect for switching things up at your standup workstation. 20% Off Coupon from PaleoTreats.com. Yes, there is such a thing as a paleo peanut butter cup. 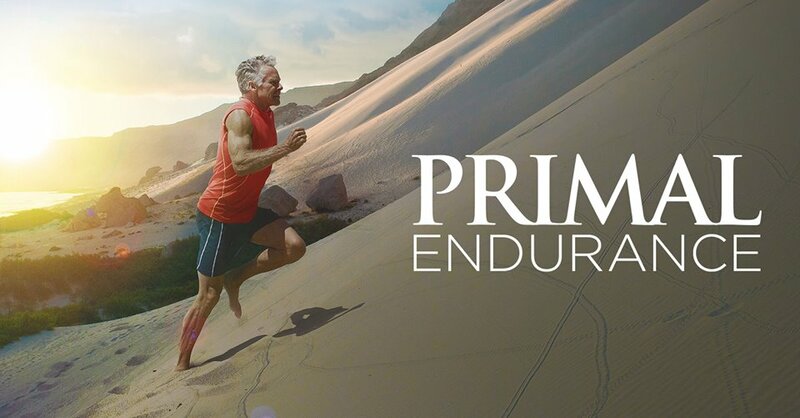 10% Off Coupon from PrimalPacs.com. Organic, grass-fed, grass-finished beef jerky, dried mango, roasted and salted macadamia nuts, marcona almonds and dried cranberries? Umm… yes please. 25% Off Coupon for a Soft RAD Roller from RadRoller.com. The next best thing to a personal masseuse. 50% Off Coupon for a Vejibag 3-Pack from Vejibag.com. No more slimy vegetables! 20% Off Coupon for Nicks-Sticks.com. Not just any old sticks. Grass-fed beef sticks. 15% Off Coupon for NikkisCoconutButter.com. This stuff is like manna from heaven. 20% Off Coupon for PrimalLifeOrganics.com. Organic, paleo, gluten-free, vegan skincare for 21st century cavemen and women. 2. A personal invite to a private Live Webcast Q&A Session with author Denise Minger. Spend two hours with Denise on Wednesday evening, January 8, from 6:00pm-8:00pm PST for a live Q&A discussion. 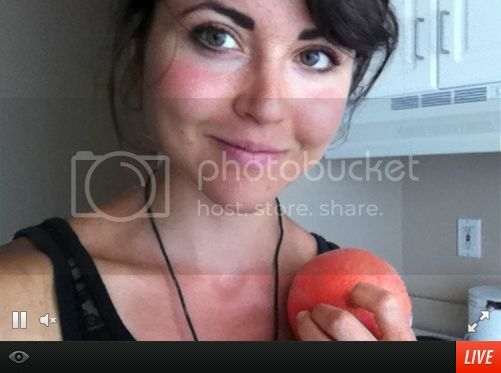 Ask Denise anything you want via in-browser instant message. She’ll be answering as many questions as she can about the problems in both conventional and “alternative” wisdom, how to individualize your diet for optimal health, and how to understand the scientific findings we hear every day in the news. 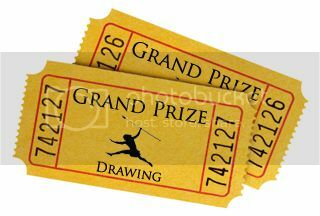 One lucky winner will receive a grand prize $1000 gift certificate to Tropical Traditions. 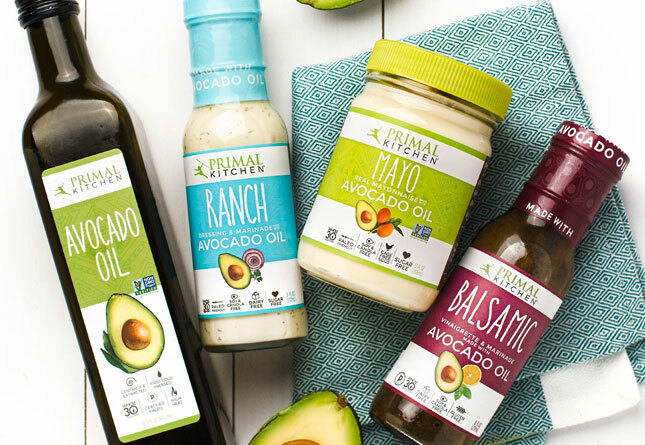 Order up to $1000 of grass fed meat, wild Alaskan fish, organic coconut oil, organic dark chocolate, natural skin care products and household cleaners, or anything else from Tropical Tradition’s large range of primal products and get it all for free if your name is selected. Three lucky runners-up will receive 10 packs of Tendergrass Farms pastured pork franks ($100 value). These are not your average hot dogs. Tendergrass sent me some of these and let me tell you, they are delicious. They’re also sugar-free, nitrite-free, GMO-free, and 100% pastured pork, and only contain these seven ingredients: Pastured Pork, Salt, Coriander, Nutmeg, Garlic, Red Pepper in real pork casings. Five lucky runners-up will receive a Focal Mogo ($100 value). As I shared in my “How-To: Standup and Mobile Workstations” article, I use a Focal standup workstation at my home office. This is your chance to win a Mogo: a telescoping stool of sorts you can use to take some of the weight off while at your standup desk. So what are you waiting for? Grab your copy of the riveting new book Death by Food Pyramid for just $24.95 (plus FREE S&H) and claim all of these free gifts today! Thanks in advance to everyone that orders a copy and participates in this special offer. Grok on! Unlike previous retail channel promotions, this one is simple: You order the book directly from PrimalBlueprint.com and we send you all the free bonus items. No worries, no hassles! 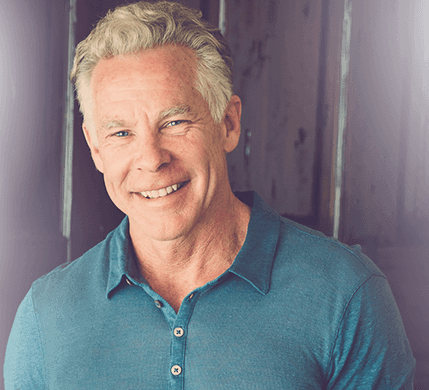 You will receive an email within an hour of placing your order that will provide you with all of your coupon codes and instructions on how to access the Live Webcast. This email is separate from your email receipt. This special bonus offer ends at 11:59 pm, Dec. 31, 2013 (PST). 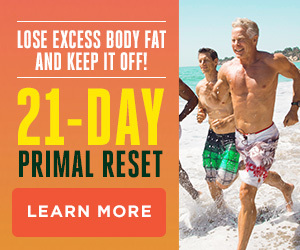 Only orders placed on PrimalBlueprint.com will receive the bonuses. Death by Food Pyramid is not yet available on Amazon.com or at other retail locations. Sweepstakes winners will be randomly drawn and announced on Jan. 1, 2014; a great way to start the new year! Both domestic (U.S.) and international orders are eligible for the bonuses, but keep in mind that only Mogo, Vejibag and Rad Roller ship outside of the United States. Only domestic orders receive free shipping and handled on Death by Food Pyramid book orders. A handling fee is added to international orders. All coupons expire on or after Jan. 15, 2014. 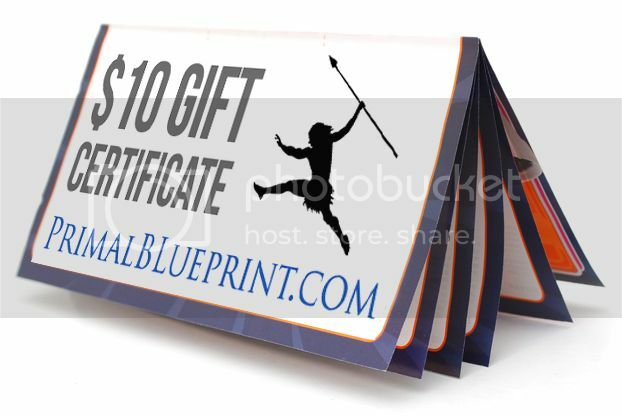 The PrimalBlueprint.com gift certificate expires on January 31, 2014, and is valid for a single use. The “Primal Coupon Book” is not an actual physical coupon book. All coupon codes will be sent to you via email. Read all sweepstakes fine print here. Get Your Copy of Death by Food Pyramid Today! Next post >Do You Use Food As a Crutch? I can’t wait to get my hands on this book. I have high hopes for it. And look at all the goodies too! 🙂 It couldn’t come at a better time! Me too! Just went on my Christmas list! Excellent, been looking forward to this book for a long time! After devouring the info on Denise’s site was really looking forward to this book. But where is the Kindle version? Even Amazon tells me nothing about an ebook version. This really really cruel. I was looking forward to the ebook version too! Yes, I’m wondering the same thing. Where is the Kindle version? I pretty much stick to items on my Kindle…. I definitely will purchase once available this way but not until. Kindle version would be good. I like cookery books as paper books, but tend to read more on the Kindle now (something to do with being able to make the writing bigger LOL). Probably coming soon, sit tight y’all! I usually read books on Kindle too, but Ima jump on this package! I agree. I’m only getting the book because I’ve read Denise’s previous blog posts and thought they were reasonable and well-written. A book that has such over-the-top statements on the cover would be a hard sell for me otherwise. I think Michelle Obama also set her sights, but got caught in the net. She may have had sincere intentions on improving school lunches, but found it a hard slog when you’ve got THIS fight, along with a Congress who declares ketchup and pizza as vegetables. You notice she also gave up on the school gardening programs–the USDA killed that one off. Even reforming the SNAP program to exclude sodas and candy has huge lobbying lined up against it–namely Big Processed Food and Big Farm (corn). I thought the Obamas should be sent one of these books. That was debunked by a person who was there. the selfie or the flirting? David Cameron admitted the first and the latter depends on your definition. Looked like flirting to me. Either way, rank buffoonery is the hallmark of his public life. STOP! Can we just stick to the topic of discussion and leave personal politics at the door? I come here to read/learn about health and fitness information, not be subjected to irrelevant, not to mention boring, political views. It’s one thing to discuss public policy when it directly impacts matters related to diet, exercise, and health, but can we PLEASE all agree to keep this one web site free of stupid partisan bickering? That’s what You Tube is for. I’d like to order an e-book copy, as I don’t live in the USA and it is more convenient for me. Will there be such option soon? Hoping for this aswell! Live outisde the USA and would love to get an e-book copy! Does your coupon for PrimalBlueprint. com really expire January 31, 2013? That’s some promotion there Mark…heehee! Another request for a Kindle version and when it will be available. I just want to make sure I understand this correctly. If I order from the PB website, I would get it before Dec. 31st, whereas if I order from Amazon it would ship after — and a Kindle would become available at that point? Actually, I just received an update that eReader versions should be available on or around December 20th. We’ll keep you posted on that! Otherwise yes, hard copy versions are shipping now and are included with the promotional offer until December 31st. The PrimalBlueprint.com gift certificate expires on January 31, 2013, and is valid for a single use. Do we need to use Dr. Who’s blue box to use this certificate? Thanks for taking on this project – I can’t wait to read it! Thanks for pointing this out… fixed! “things with a face..” that’ s gas! Great stuff Sue, as always. I’ll be ordering this book today for sure. Your razor mind is very hot! Whats the chances of getting it put up in digital form? I dont buy paper books anymore, they take up too much room!! I look forward to reading it, mostly because I like to read all manner of health books, from vegan to paleo and beyond. I read, or saw, pretty recently a show/ article (can’t remember!) where there was in interview with one of the nutritionists who worked on the first food guidelines in the 80’s (which were never released). She pointed out that their recommendations were vegetables and fruits on the “bottom” (there wasn’t really a pyramid back then), but by the time the pyramid was released years later somehow the grains had been put there – contrary to all of the study results they had to date. This is covered in great detail in the beginning of the book. I would dearly love to participate in the promotional offer and begin reading this important work of what I expect to be a rigorous critique of the “science” undergirding current health and nutritional policies, but I cannot because the book is not available in an accessible format; that is, in a format accessible to those who must access information in a non-traditional manner. I am visually impaired and require that lengthy information be in an audio format due to the visual reading constraints of my limited functional vision. The ideal case is to purchase an audio recording with human narration. I typically do this if such a titles available on audible.com, but only a small percentage of books have been recorded. However, the increasing spread of e-books combined with synthetic speech bundled into e-reading software has meant that I can read a much greater variety of books. This has opened up a world of information previously inaccessible to those who cannot read traditional books. This is precisely how I was able to order and read “Primal Connection” when a recorded version is not available. eReader versions will be available on or around December 20th. Oh no, you don’t want this as a Kindle book. This book belongs on the coffee table for permanent display! Love this ( and ordered it, of course! ). This is excellent! Ordered the hard copy and am excited to have something to read on my upcoming ski trip. Also, thanks for the codes. I’m using the vejibag one as well, as it’s so arid where I live and this claims to be able to make all my fresh produce stay fresher; I’m hoping it lives up to the testimonials. Just so you know, the vejibag code included in this order is not actually 50% on their site, it’s approximately 43% off. Oops. Thanks Mark and Denise and all others involved! We hope you enjoy your copy and Vejibags! I have a few myself and they really do work. When I buy pre-washed mixed greens, I transfer them out of the plastic container right away. They usually get slimy within just a few days when keeping them in the bin or plastic bag. As far as they discount, they do have a small holiday sale going on for this package – from $48 to $42 – so $24 is 50% off of their normal retail price. ahh! 50% off retail. That solves that math mystery. Thanks, and I can’t wait for the bags and the book! I read the sample and I was just wondering, does Denise have amalgam fillings? I had one small amalgam put in when I was about 10, and it was taken out when I was 17. All the other work I’ve had done has been ceramic. She writes very well, it’s compelling.. might have to actually order this! It was an overnight sensation and Denise acknowledges that in her fist interview with Jimmy Moore. Dozens of bloggers took up the charge immediately, and I did a subsequent post recognizing all of it. 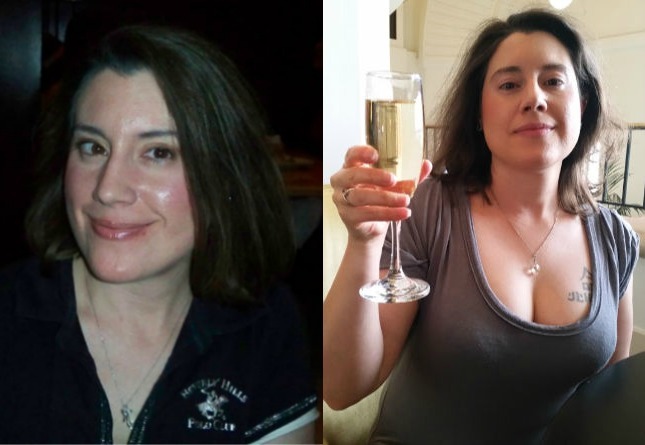 So, one of my proudest initiatives in 5 years of paleoish blogging. And you, Mark, got her to actually write a book all while her last blog post is about a year and half ago. This is not your time nickoly. You are trying to steal thunder. Grow up. Eager to read the excerpt but not showing up on my iPad! I can see the cover only. When I click on any of the arrows, it says page 2 or 3, etc but the page is blank! What am I doing wrong? Tried the excerpt again and it’s working fine in my iPad now. Don’t know what was wrong before. Great read! Will definitely get the book. I prefer hard copy to ebooks; just got to make notes in the margin, etc. and find it easier with a tangible book. I will totally buy the Kindle version. I may buy some hardbacks for gifts. What I would REALLY like is an autographed one, like Mark did when he put out his first book. I got one of those. The growth in electronic books is amazing. Maybe I should enter the 21st century. Naw. I’ll buy the old fashioned book. Denise is a great writer. I hope this, and the upcoming Primal Publishing books, knock conventional wisdom out of the water. What’s nice about ebooks, is that it is instant. No waiting for the mail or running to town! I read on my kindle, but some books (like this one, and cook books) I order hard copy. …..Plus, you can carry a whole library around with you. Amazon offers many classic books for free. Most of the stuff on my kindle cost me absolutely nothing. I still prefer actual books, but kindle has it’s advantages. Not kidding, I was just thinking about Minger’s up-coming book yesterday, thinking about whether she was still working on that or not !! Ordered! I can’t wait to share with the non-primal’s in my life! I love the title of this book. I am hoping to see Denise show up on some national TV shows. I know it is hard to get noticed among their many options. This title just might peak the interest of the producers. Looking forward to this one! It looks like a nice companion to Marion Nestle’s Food Politics, which I recommend to absolutely everyone. Kudos to the author for this much needed book!!! Looks like a great read! Will buy it when the Kindle version is released! I know I am familiar with a lot of this info, but would be great to learn more! Just to support the awesome Denise Minger, and because I think she deserves great success in the world, I bought the hardcover. Have not done that for years, generally waiting for paperback or kindle versions. However, this will be nice to share with my mother, who is reading Grain Brain, and actually starting to change her mind about what she has practiced as healthy eating for a great many years. To her credit, she is 76 and takes no medicine, is very healthy, despite all the whole wheatedness in her life…. I’ve been waiting for this book forever! I’m glad to learn that it will be out to the world to kick off 2014. I’ll be promoting it more than I should. I fell in love with Denise when I first “met” her a few years ago! If you love her, then ask her to marry you dude. I just tried to fill out the order form but international shipping didn’t show up. Only free domestic S&H option was shown. Go ahead and use the only shipping option available. All customers, regardless of location, get free shipping. International customers pay a handling fee. Also, we’ve changed the text to avoid further confusion. Thank you for your order! Oh brother. Really? The “paleo versus vegan” battles are quite amusing. I agree the battles are amusing 😉 but the book is actually not pro-paleo or anti-vegan. It critiques both of those diets, and acknowledges where they’ve each had success. Sounds fascinating. When will it be a available for kobo e-readers? Just a heads up for international customers like myself who are just after the book with no interest in the bundled discounts. Although the postage is free the handling fee is $29.95. There is nothing wrong with this as it is clearly stated a number of times about the handling fee. If you look around you can get a copy with postage fees included for less than the handling charge. I placed a pre-order on amazon and getting hard backed in a few weeks for £14 with free delivery. Think this is about 20$? So will have to wait but considerably cheaper for uk customers. Was all ready to purchase but cannot justify $29.95 for handling to get it to Australia. Would love to support MDA and the author. Was hoping to be a xmas present for wife and myself. Will wait until new year to get locally. Yeah the $29.95 was a bit steep for me too (I’m in Australia also). I would have loved to support the cause – and don’t get me wrong, I definitely understand it takes money to send a package around the world! – but unfortunately $55 altogether for one book is too much. Wouldn’t no handling charge be a nice “freebie” for us international customers who won’t see the other niceties? Looks like it’ll be the e-version for me. Tried the Scribd preview, but it’s set to “private” ? Totally not fair that us dedicated e-readers can’t get in on the “deal”! I keep all my books in Kindle because I can take my whole library with me everywhere and I read voraciously! Just sayin’….I would have bought and downloaded this yesterday if the e-book was available. Ordered. Have to get it. She is amazing to read and I know her book will be great! It’s not a food pyramid now though, right? Not saying the book isn’t great, but it just loses me a bit with that title since it doesn’t accurately reflect what we’re dealing with at the present time. The history of how we got to this point would be interesting though. And, yeah, the language seems to make it a bit polemic which doesn’t seem necessary, but, hey, it’s controversial and might sell more copies… Anyway, I’ll gladly read it. Needed the Nook version and I would have ordered already! Wish I could read the Scribd version. When I try it says document is set to private (“Sorry! This document is not publicly available.” ) is this happening to anyone else? Sorry, but we can’t replicate that problem on our end. Maybe try a different browser? My Vejibag discount is only $18….? Am I doing something wrong that I’m not seeing the coupon appear with a value of $24? Wow, good stuff! Her prologue is a brilliant description of what’s wrong with just about everything: the total reliance on and total trust in “experts” (the more degrees, the better and the government knows what’s best for us!) the inability to think critically or to question anything, including our own premises; the inability to be open minded enough to search for Truth without regard for where it leads, and the total lack of healthy skepticism. Thank you for your contribution! Do you know if the book will be translated into German? As a dentist I may be biased in my comments. First I find it interesting that she makes fun of her dentist despite the fact that he appears to be the one that triggered her to question her diet. Also, maybe I’m stupid, but I did not know that being deprived of fat soluble vitamins caused decay. I thought that decay was caused by ingesting a lot of carbs which are then metabolized by oral bacteria into acids that rot the teeth- but then I’m just a stupid dentist. I apologize if the prologue came across as making fun of my dentist — my only intent was to paint him as a colorful, quirky dude (which he was, in an awesome way). I am grateful for that experience as the wake-up call that prompted me to research nutrition more seriously. I’m no longer convinced about the link between carbohydrate and tooth decay, so long as the rest of the diet is nutritionally adequate. As I discuss in the book, there have been a number of grain-eating, non-toothbrush-using cultures who remained virtually free from cavities — but their diets were universally rich in fat-soluble vitamins. 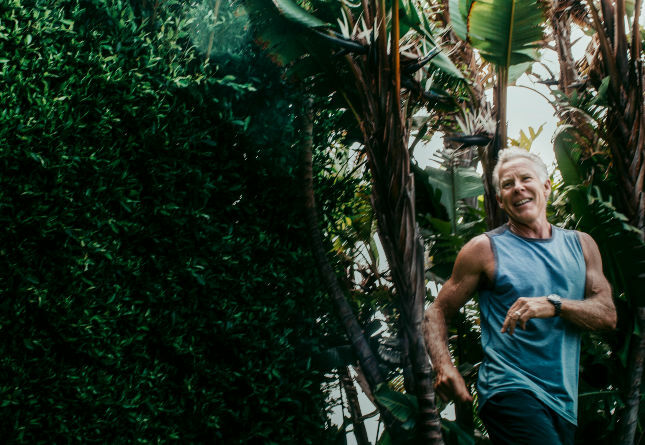 Likewise, I healed my own teeth on a high-carbohydrate, fruit-based diet; the only thing I changed from my raw vegan days was adding sources of vitamins A, D, and K2 from egg yolks, hard cheeses, fermented goat yogurt, and eventually seafood. I still eat a high-carbohydrate diet and no longer get cavities. Catchy title. Denise, I look forward to the book. You are a prolific writer and I hope this is a book grounded in science. Hopefully it isn’t rife with statistical fallacies like your “critique” of the the china study, as exposed at primitivenutrition.com as well as by t colin campbell’s himself. I backed a Kickstarter for the film “In Defense of Fat” and am supposed to get a free copy of “Death By Food Pyramid” as a reward. Do you know if these will actually be sent out to backers? The Kickstarter page and other social media for the film have not been updated in months. I messages Kennon and have not heard back from her. …come on sunbeam let your words and smarts speak for themselves as they so frequently do. It’s a super site, really. I may be jealous, i don’t think so but what do i know. While I would prefer Kindle, for some reason I seem to be trending toward hard copy for a lot of Paleo stuff. Primal Blueprint is dog eared, highlighted and stained now. The mark of a well-used book. I went ahead and ordered here rather than on Amazon (though I might have saved about $7 on Amazon. I note the date on this article is December 11, exactly a month to the day after Veterans Day (Remembrance Day to us Aussies) , a more than slight irony when you consider the food pyramid has (in my opinion) probably caused the deaths of more Americans than both World Wars plus the Korea and Vietnam conflicts combined. I reviewed the excerpt. It appears to be a first-person account of a journey to enlightenment, including lots of colorful metaphors, with elements of fact-based scientific foundation mentioned or implied in the story and its arguments. This may be a great read. 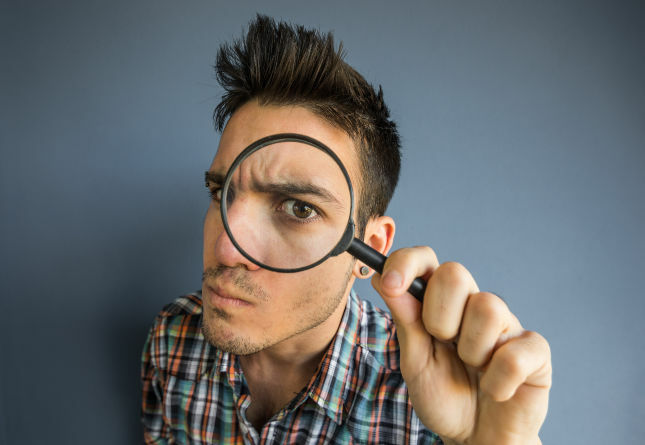 However, the excerpt does not include any part of the Notes section (pp 249-276), in which a potential buyer may expect to find a listing of references or sources that the author researched. But maybe not, because the body text pages excerpted here have no in-line references or footnotes. I agree with the other comments about the book cover’s hyperbolic and dissonant text. It can be kind of a… turn-off (for lack of a better term). I would hesitate to give this as a gift to somebody who is not already on a Primal (or similar) path — i.e. somebody who needs conversion; somebody who (as the subtitle selectively states) is unhealthy. These issues result in a product that, to an important part of a potential audience, initially *appears* to be incredible and unauthentic. I finished your book today. I could not put it down, literally, for two days, although I did actually have to get work done. And, wow, thank you for getting this project done. Infuriating, fist pounding, jaw dropping, eye bulging, and….embarrassing! I think that pretty much sums it up. I am looking at so many things I am doing in a different way so thank you for that as well. Although we in the primal community understand the underhanded role of the USDA, FDA, etc. in these instances, still truly shocking to realize the extend and we thank you for exposing it all, and so much more. You are definitely a gifted young researcher and I for one will be following your work, as you take the next steps, with much excitement. I am seeing signs all around me that *people are not developing correctly anymore*, never mind how fat we get. Faces do not grow to full potential (guess what? Wisdom teeth are not vestigial, and we are NOT failing to make room for them due to food being “too soft”), more and more kids need orthodontic braces and glasses, and more and more women are having trouble carrying pregnancies to term–or getting pregnant at all. We may even be able to lay some of the autism epidemic at the feet of substandard nutrition. There’s some actual evidence in that direction, though I’m not sure how strong it is. We’re in big trouble, people. If all you care about is how many fat people you have to see in the course of your daily life, you are completely missing the point. 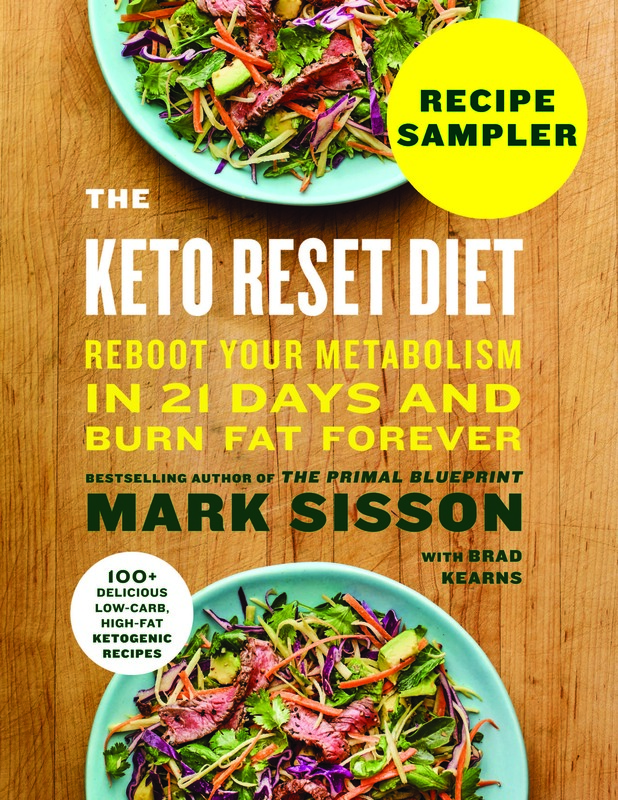 While I do not like the WAPF’s heavy emphasis on grains, I appreciate Dr. Weston Price’s work in this vein and I think everyone interested in Paleo and Primal should read it at some point. I have not yet read Pottenger’s Cats but that’s on my short list along with Minger’s book. The true measure of a good diet is how well it *develops bodies*. Period. I’m having to live with the physical effects of my mother not having eaten well during her pregnancy with me (or before, or after). My daughter is having to live with the effects of me not having eaten well for her. I want to see an end put to this sort of thing. It’s tragic and so unnecessary. After exploring a few of the articles on your site, I really appreciate your way of writing a blog. I saved it to my bookmark website list and will be checking back soon. Take a look at my web site as well and tell me what you think.